This is a framed oil on canvas painting. With "totem Poles" Stop of Interest sign. 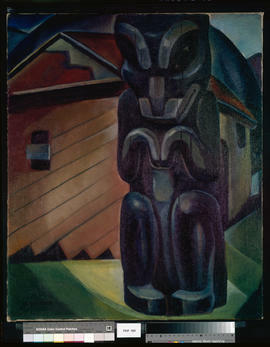 "This totem pole stands on an eminence overlooking the station of the CNR Co. in Prince Rupert. It is probably the finest specimen of the old-time carving on the Pacific coast. Carved for a Nishga chief named Dauk it stood in front of his lodge at Gitlakdamix on the Upper Nass River over fifty years"